New Sonicare Elite electric toothbrush's Superior Cleaning Technology offers better plaque removal between teeth. Inspired by sonic technology used by dental professionals, this new and improved Philips Sonicare uses patented, dynamic cleaning action to gently and effectively remove plaque from deep between teeth and below the gum line. 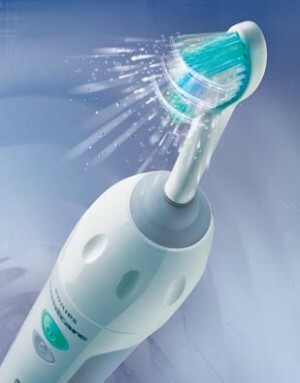 Sonicare's ultra high-speed bristle tips move up to three times faster than other leading power toothbrushes. Sonicare Elite directs side-to-side sweeping and twisting action for optimal results. The new ergonomic soft grip handle improves maneuverability and is 30 times lighter than the previous model. The added dual-speed control offers high speed for optimal plaque removal and low speed for sensitive areas. Clinically proven to reduce plaque, reverse gingivitis and help reduce periodontal pockets, yet it's gentle on your gums. The extra-soft rounded bristles ensure deep, yet gentle cleansing. Significantly reduces coffee, tea and tobacco stains for naturally whiter teeth in just 28 days. New features also include a slim, angled neck, a tapered brush head and contour-fit bristles for hard-to-reach areas. Smart-timer two-minute shutoff encourages you to brush for the dentist-recommended time. Quadpacer 30-second interval timer helps manage thorough brushing of each quadrant of your mouth. EasyStart gently increases brushing power over first 12 uses. Comes with a charger base, brushhead holder, travel case and wallmount kit. Charger plugs into wall outlet. Two year manufacturer's warranty.